We’re announcing a special opportunity only for ElvisCostello.com members to take part in a historic music television event in New York City next week. 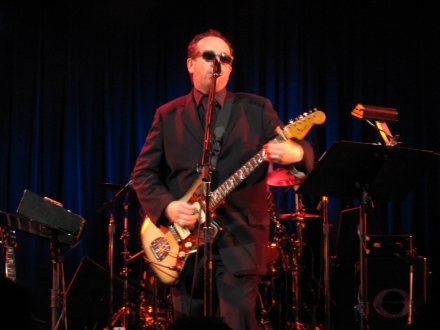 We have a small number of tickets to give to a few lucky members who would like to attend a taping of Elvis’s forthcoming TV show Spectacle: Elvis Costello with…! Elvis’s guests for this episode include Norah Jones, John Mellencamp, Roseanne Cash, and Kris Kristofferson! Tickets are extremely limited and will be distributed on a first-come, first-served basis: Please, respond ONLY if you are absolutely certain that you can attend this event. By Friday, September 12th, all confirmed ticket recipients will receive an email detailing the procedure for the issuance of tickets, as well as providing further information regarding this extraordinary event. This is an exclusive event wherein the buying and selling of tickets can and will result in the forfeiture of said bought and/or sold tickets. Confirmed guests for episodes taping over the next two weeks at Harlem’s world famous Apollo Theater in New York City are: iconic American singer-songwriter James Taylor; jazz legend, and winner of this year’s Grammy Award for Album of the Year, Herbie Hancock; one of the most acclaimed new artists of the past decade, Canadian Rufus Wainwright; the brilliant singer-songwriter Rosanne Cash; actor/singer-songwriter Kris Kristofferson; jazz superstar Diana Krall; recent Rock and Roll Hall of Fame inductee John Mellencamp; singer-songwriter Jakob Dylan; indie duo She & Him, comprised of actress Zooey Deschanel and musician M. Ward; international sensation Norah Jones; singer-songwriter Jenny Lewis; and from the world of opera, the renowned American soprano Renée Fleming. As previously announced, the Canada/United Kingdom co-production also features The Police, former president Bill Clinton, Tony Bennett, Lou Reed, Smokey Robinson and Sir Elton John, who is also one of the program’s Executive Producers.